Immigration: Did Talk Hosts Kill The Bill? In the midst of the heated Senate debate over the immigration bill, one notable conservative made headlines for lashing out at a conservative-dominated medium. “Talk radio is running America,” complained Mississippi Republican Senator Trent Lott. “We have to deal with that problem.” On June 28—more than 40 days after the introduction of a compromise immigration bill backed by President Bush and some senators—the year’s most ambitious domestic legislative initiative was defeated in the Senate. Lott was not alone in attributing the bill’s defeat to talk radio. Some Democrats even talked of reviving the long-repealed Fairness Doctrine as a way of potentially balancing the politics on conservative-dominated talk radio. In talk circles, this became known as the “Hush Rush” bill, a reference to conservative radio host Rush Limbaugh, who was a vocal critic of the immigration bill. Is there any quantitative evidence to suggest Lott and other critics are right? To what extent did talk radio or the media in general help kill, at least for now, the immigration reform legislation? If impact is measured in attention, then there is little doubt that it grew significantly this second quarter, according to the data in PEJ’s News Coverage Index. Immigration was the fourth-biggest story in overall this quarter, taking up 6% of the newshole, roughly triple the amount of coverage the issue received in first three months of the year. Most of that rise was coverage of the legislation in Congress. In the period between the May 17 announcement of the compromise immigration bill and its June 28 demise, the subject accounted for 9% of all coverage and was the top story in the media. The jump was also not just in talk radio. Coverage of immigration in the second quarter increased dramatically in every sector of the media. It was the second-biggest radio story (9% compared to 1% in the first quarter), the third-biggest newspaper story (5% compared with 2% in the first quarter), and third-biggest cable topic (7% up from 2%). Among conservative talk radio hosts, the immigration debate was the # 1 topic in the second quarter, filling 16% of the airtime. (The second-biggest topic was the campaign at 13%). That is eight times the amount of attention that conservative talkers paid to the immigration debate in the first quarter of the year, when it accounted for only 2% of the newshole. (Those listening to liberal radio hosts such as Ed Schultz and Randi Rhodes, in contrast, were not hearing nearly that much. They spent about a quarter as much of their time on the subject, 5%, which ranked immigration as the sixth-biggest liberal talk subject.) What listeners of the conservative talk radio media were hearing, in large part, was that the legislation itself was little more than an “amnesty bill” for illegal immigrants, a phrase loaded with political baggage. On his show, Hannity paraphrased former House Speaker Newt Gingrich by declaring that “you cannot begin your career or your life as an American by first breaking the law.” Savage was blunter, conjuring up images of the nation being overrun by illegal intruders. “We’re not giving away the sovereignty of America,” he told listeners. “This is the Alamo right now!” The radio hosts were joined by some of their colleagues on the cable side including the Fox News Channel’s Bill O’Reilly. But no one could match the attention devoted to the issue by CNN’s Dobbs, a relentless advocate of tougher immigration enforcement and a staunch opponent of the immigration bill. 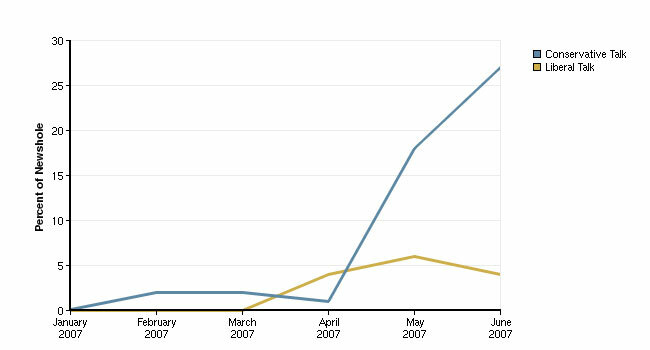 According to PEJ’s analysis, Dobb’s devoted a full 27% of the airtime on his nightly show to immigration during the second quarter of 2007, with much of that coverage highly critical of the measure. On June 29, the day after the bill went down to defeat, Dobbs celebrated by reading the congratulatory emails he got from viewers. In all, immigration was the second-biggest story of the quarter on CNN at 9%. It was also second on the Fox News Channel at 8% and the fifth-biggest story on MSNBC at 5%. So Dobbs may have led the charge on cable, but he had plenty of company. So, did talk radio kill the immigration bill? That is harder to prove. What can be said is that talk radio made immigration a major issue–conservatives on radio made it their No. 1 issue. And the media generally made more of it than it had in earlier in the year. What is unknowable from this data is whether that media attention translates into political pressure—in the form of letters, emails, blogs or phone calls, etc.—which in turn changes votes in Congress. It was one of those made-for-cable media moments. Early in the afternoon (EST) on June 8, a handcuffed Paris Hilton was taken from her home and unceremoniously deposited into sheriff’s car #865. She was headed back to court for a date with an angry judge who was about to send her back to the jail cell she had just been prematurely released from. With TV cameras monitoring the police car’s slow-motion odyssey through the LA streets, viewers could be forgiven for having an O.J. Simpson white Bronco flashback. “The media frenzy is wild” declared CNN’s entertainment reporter on the scene at the courthouse as the press hordes crowded in for a view of the socialite/party girl/jail bird. Hilton’s incarceration adventure for violating her drunk driving probation put her in the public spotlight she seems to crave. And for the week of June 3-8, her travails were the fifth biggest story of the week, consuming 4% of the overall newshole. For only the second time this year, a tabloid celebrity saga registered as a top-five story in any week—the first being the mysterious Feb. 8 death of pinup/heiress/actress Anna Nicole Smith. When it comes to media attention, there’s a tendency to lump the two camera-friendly blondes—Anna and Paris—together. Coverage of both seemed to be ubiquitous and inescapable. But a look at PEJ’s data from the first half of the year suggests something very different. The Anna Nicole Smith case was a relatively long-running event that ended up the eighth-biggest story (at 2% of the newshole) in the first quarter of 2007. And, during the heart of the story (Feb. 8 – March 2), it climbed to the third-biggest story overall (8%) and the top story in cable (22%). Paris’s jailhouse blues represented a passing media moment that commanded considerably less coverage in the mainstream media. Hilton made the most news in June. She was originally sent to jail in the first week of the month, was then prematurely released and sent back on June 8. After having served her debt to humanity and announced that she had found God, she emerged from lockup in the morning hours of June 26, walking to her freedom surrounded by a phalanx of reporters and photographers. 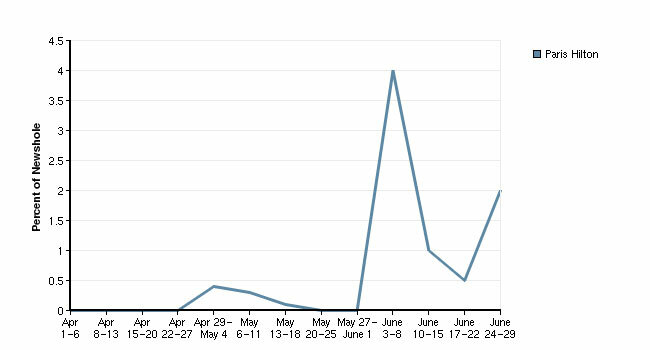 But even with her highly publicized release, Hilton was only a top-10 story during the one week of June 3-8. And in no other week in the month did she exceed 2% of the overall coverage. That’s a far cry from the Anna Nicole Smith frenzy. There may be a number of reasons that explain the coverage discrepancies in the two cases. The death of a celebrity—particularly under murky circumstances—is a far weightier matter than a brief incarceration, which is becoming more and more commonplace among the Hollywood crowd. The Hilton case did not entail the legal/courtroom drama that consumed much of the Smith coverage. Nor did her story feature the roster of media-friendly supporting players such as the two men, Howard K. Stern and Larry Birkhead, who both claimed to father Smith’s infant daughter Danniellyn. And let’s not forget Judge Larry Seidlin, who presided during the Smith case and generated plenty of coverage with his unorthodox behavior that included a crying jag in court. Yet it is also possible that the press felt some backlash against the criticism it suffered over the Nicole coverage. That is harder to know. If Hilton’s jailing ever had the chance to expand into a meatier story, it was during that brief interval between her early release and when she was sent back by Judge Michael Sauer. That’s when the issue of a double standard in the legal system surfaced. Activists such as Al Sharpton protested what they called “celebrity injustice” and during a June 7 CBS report, correspondent Bill Whitaker reported that “a fed-up public is going ballistic” over Hilton’s early release. At that point, it appeared possible that the Hilton saga could take on broader cultural and social implications. At one point, as Hilton was getting ready for her ride back to court, MSNBC abruptly interrupted a discussion of the retirement of Joint Chiefs of Staff Chairman Peter Pace with the anchor announcing: “here’s Paris Hilton now." But once she was ordered back to her cell, mainstream media coverage abated. Despite the proliferation of glitzy supermarket magazines, gossip Web sites, and Hollywood-oriented tattle TV shows that traffic in the travails of the rich and famous, it is difficult for a celebrity behaving badly to make a major impact on the mainstream media’s news agenda (Britney Spears’s various indiscretions, for example, never crack the top-10 story list.). So far this year, the two tabloid sagas to emerge as major mainstream stories have been Anna Nicole Smith’s death and Paris Hilton’s jail stint. Aside from involving blondes, the two stories have something else in common—the protracted and deep involvement of the U.S. legal/ judicial system. 1. 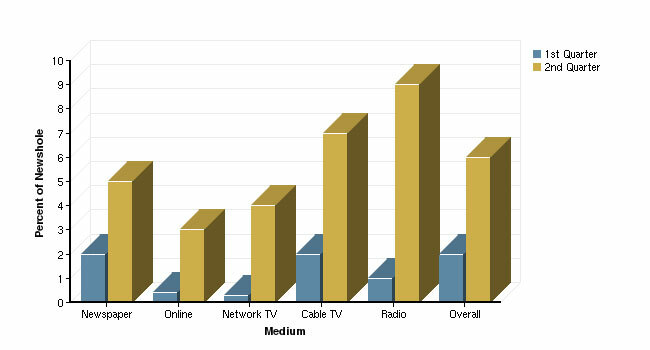 Audience data attributed to Talkers Magazine, 2007.